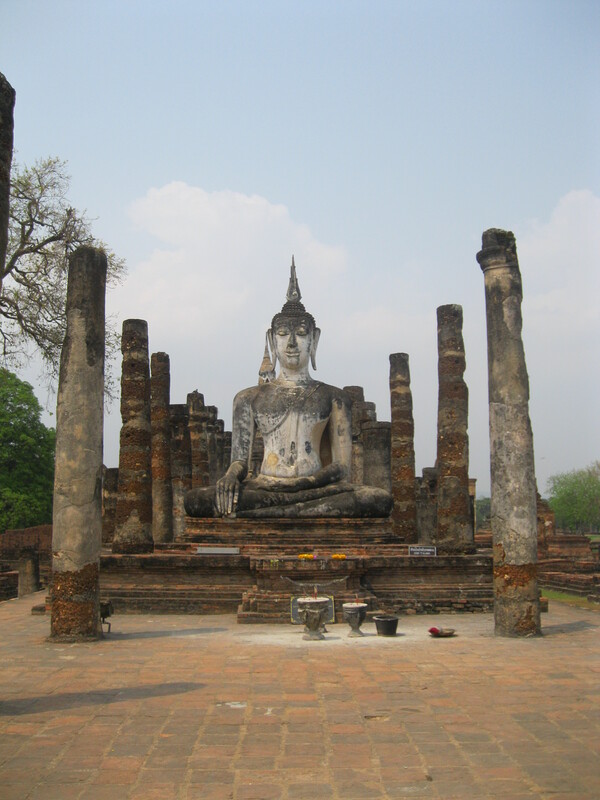 Let’s face it, without the ancient ruins Sukhothai would likely be just another blip on the way to Chiang Mai. The 13-14th century ruins are this old capital city’s claim to fame, but boy do they deliver! The ruins are in immaculate condition considering their age. 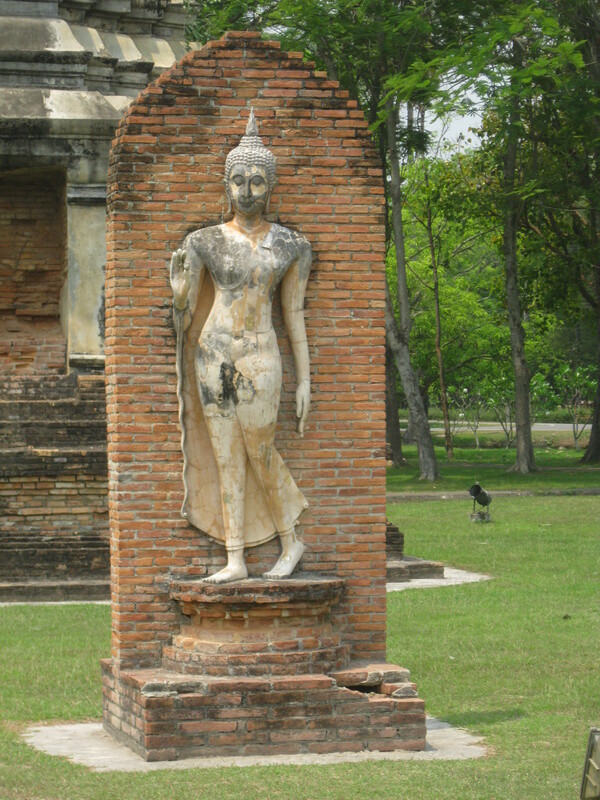 While the ruin sites at Ayutthaya are spread apart from one another, making it difficult to see them all in one go, this is not the case in Sukhothai. 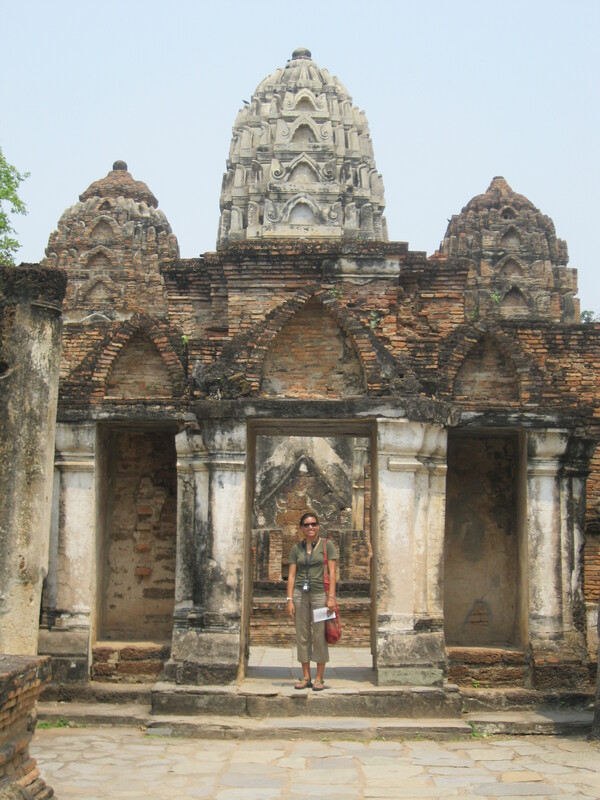 Over 196 ruins including the remains of a royal palace, and twenty six different temples, can all be found on the 70 sq. km – of UNESCO park grounds. For a small fee you can rent headphones for an audio guided tour, where a David Attenborough-like voice whispers sweet tidbits of Khmer history in your ear as you walk between the numbered ruins. The park is also lush with tropical vegetation and small lakes, making it truly a gorgeous sight to behold. Buddha, Buddha, Buddha rockin’ everywhere! Cheap with a pool?! Say what? I’m in. The tuk tuk dropped us off at the 4-T Guesthouse, located in the part of Sukhothai knownhttps://wordpress.com/stats/jaiguytravels.wordpress.com as the new city. The guesthouse was close to many restaurants, a night market, and the two main bars we found in Sukhothai. For 300 baht a day (about $8 USD), my girlfriend and I shared a bungalow style house with a comfy bed, western toilet, and hot water. Unlike our bungalow in Pai that was completely infested with roided-out Huntsman spiders, the 4-T was arachnid free. As promised, there was a decent sized pool that even had a deep end. We rented a motorbike from the front desk for 100 baht a day, one of the lowest, single day prices I’ve ever seen in Thailand. 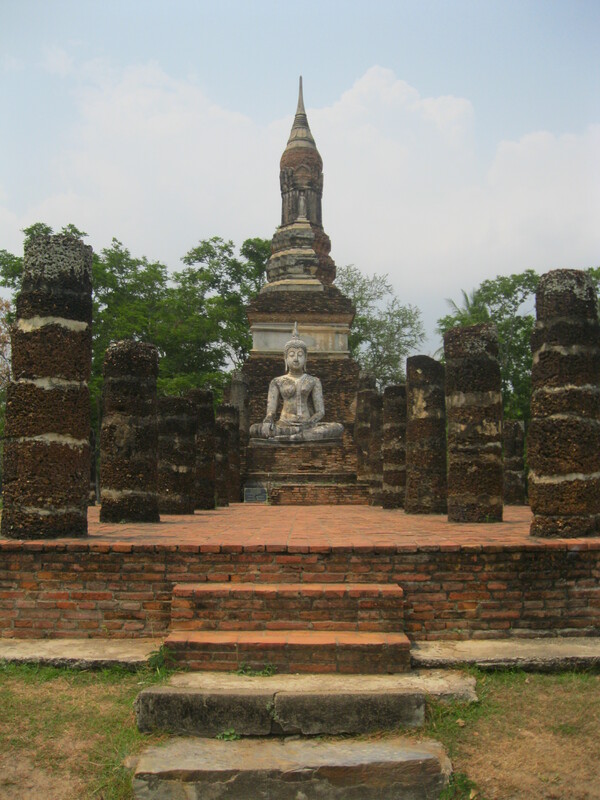 Sukhothai is not a city known for it’s nightlife, and truth be told, it’s probably because there are zero western bars, and only a couple of Thai bars lurking in faraway areas of the old city. After a long hot day of exploring the ruins we took to prowling the streets with dry throats and underactive livers. We searched high and low for a good watering hole, but alas, after walking the whole of the town we were still painfully clear headed with the weight of the day’s adventuring making itself known in our knees and feet. Then, like a gilded and furry Lancelot high atop a noble steed, Fong Bear bar glowed ahead of us. Promising a vast selection of bottled import beer from around the world, and a selection of draft beers that included more than the standard Chang, Singha, and Leo, Fong Bear Bar was our nighttime savior. As if a global roster of beer wasn’t enough to satisfy our nighttime indulgences, their pub grub was well priced and absolutely delicious. 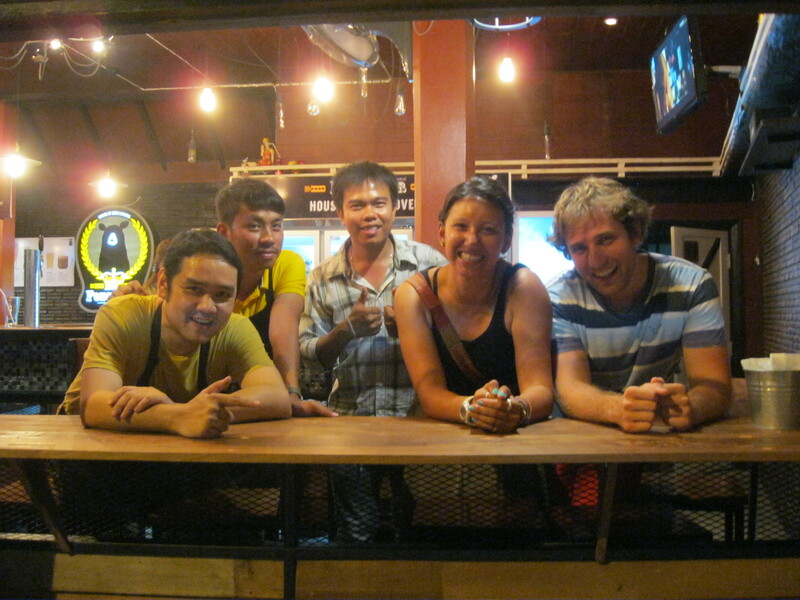 In addition, we talked at length with the owners Best and Phu, who turned out to be sweeter than a summer shandy. If you’re in Sukhothai for a night, do yourself a favor and stop by Fong Bear bar. It’s an awesome stop, and… there is really nowhere else to go for nighttime libations. You know when a town has that feel, that layout, that vibe… like you don’t have to do anything, you can just be in that location and automatically you are the receiver of some blooming sunshine-like energy? Ok, so maybe to put that feeling into a coherent string of words. 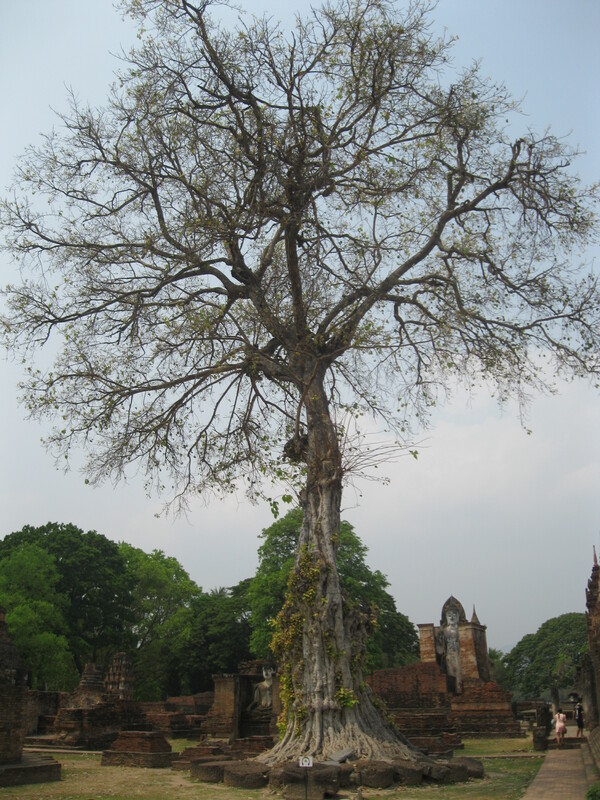 But if you’re still with me, Sukhothai has that feeling. There’s quaint coffee shops everywhere you go, and beautiful buildings dotted all throughout the city. The Thai restaurants are authentic, fresh and humble. Cruise a motorbike from the new city to the old, and feel the wind in your hair and the sun on your skin. 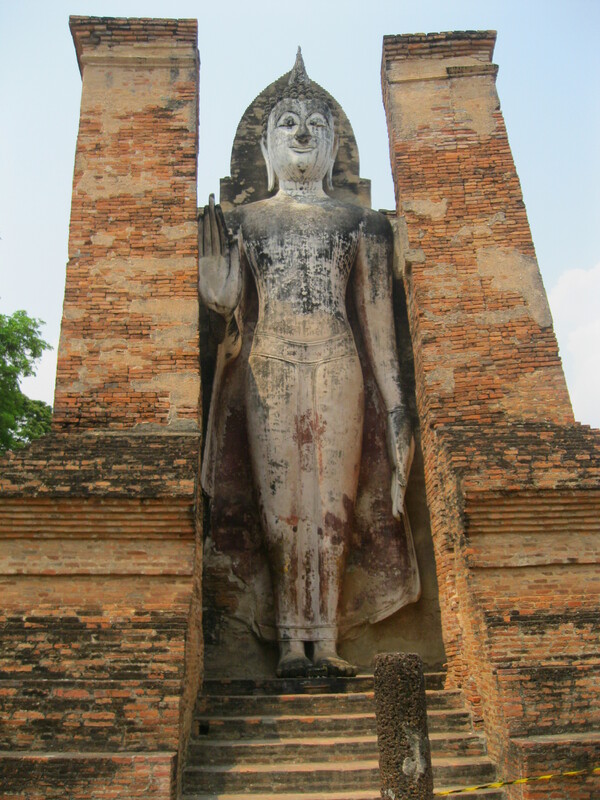 Watch history pass you by as you drive past crumbling chedis and towering Buddha statues from a lifetime long ago. Smile and feel the humbling immensity of time and it’s infinite progression. The hand out stance is pretty common among Buddha statues. It’s meant as a sign of welcome and non-violence. 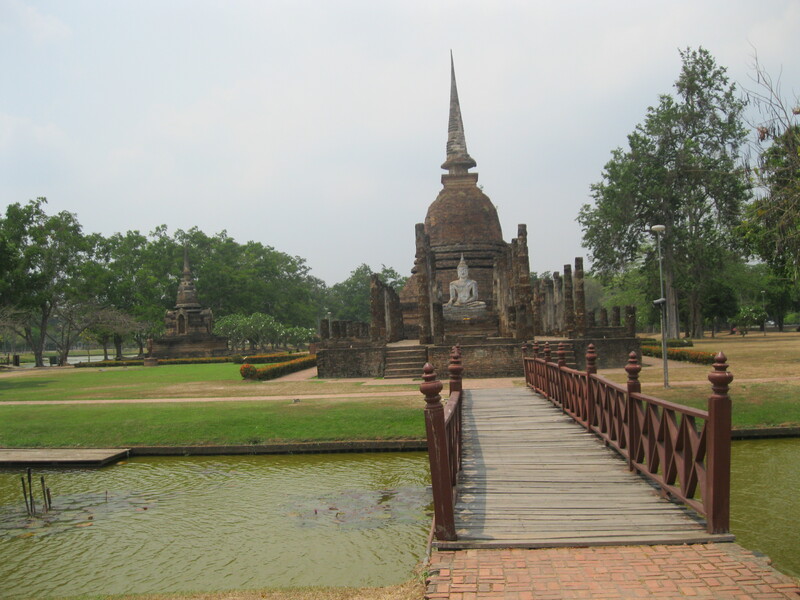 Sukhothai sounds and looks really nice! I’m gonna have to look into possibly stopping here on my travels next year when I am in South East Asia! Thanks for stopping by! 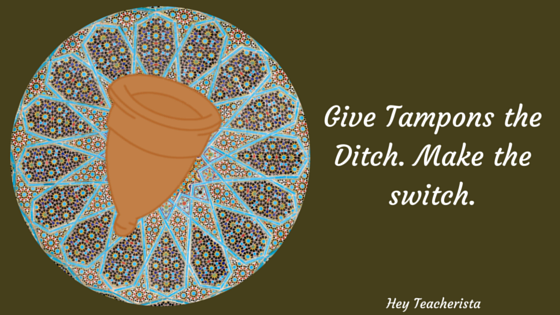 You totally should, it’s an awesome location. If you haven’t seen my post on Pai, you should have a look at that as well. 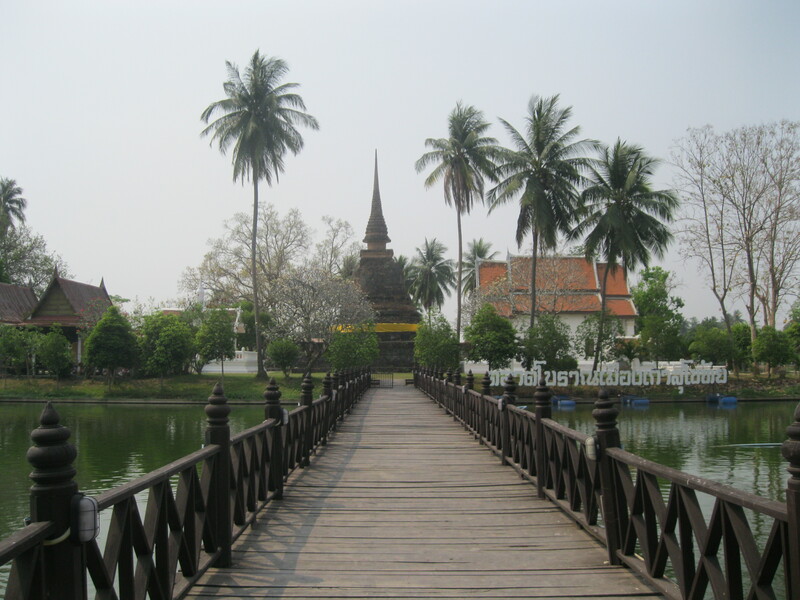 It’s a lot closer to Chiang Mai (only three hours away) and is another awesome destination with a similar feel.